It is important to be able to depend on a true industry professional to address your need for faucet and toilet service work. From installation to repairs, and even replacement, this is the type of work that should only be handled by an expert in the field. 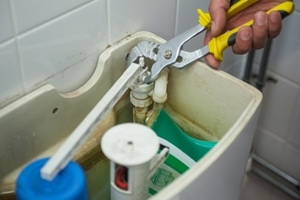 Faucets and toilets in Austin may seem like simple enough plumbing fixtures, but without the right knowledge and tools, you could end up with a mess on your hands when trying to repair or replacement these items. For local residential and commercial plumbing related work like this, the only name that you need to know is Moore & More Plumbing. We have an enormous sense of pride in the work that we do which is reflected in the results we deliver to each of our clients. This dedication to our customers is also what has helped us earn the flawless reputation that we have had since first launching the business 30 years ago. It was back in 1986 that we started taking care of expert level plumber services in the local area. Either of these fixtures can be installed improperly and you may not even know it right away. When you will find out is when you find yourself needing multiple repairs early on. This can add up quickly. Not to mention, the cost of higher water bills as a result of inferior workmanship can also get expensive. It helps to have a professional Austin plumber on your side to choose just the right fixture too. We can help make sure that you have a better understanding of the options that you have available. From there, this will enable us to assist you in making the perfect choice for your home or business. You also only want to work with an expert Austin plumber who cares about the quality of the work, not the quantity of jobs they can get through in a day. Our number one priority is always on customer satisfaction. No matter what the task at hand is, it is important to make sure that you let a professional handle it for you. Too many homeowners attempt the DIY route only to end up doing more harm than good. Don't attempt to work on your faucet or toilet when investing just a few more dollars into professional care could deliver expert plumbing services in Austin. Moore & More Plumbing is the only name that you need to know to get the job done. If you would like an estimate for faucets in Austin or the surrounding areas, please call 512-445-5212 or complete our online request form.